After a long drive to this far corner of Cornwall, we arrived to find this nice village local in former tin mining country. There is a main bar area with a small conservatory overlooking the garden at the rear. Customers were a mixture of locals with their dogs and a few tourists, some of whom were arriving for meals. Ales were Sharp's Doom Bar and a couple of guests from Skinner's - Hops 'N' Honey & Lushington's. No sign of any real cider that I could see. I opted for the Hops 'n' Honey. Not really my cup of tea. Nice pub though. Great little pub just off the St. Just to Pendeen road. Excellent home cooked food with plenty of choice. Three ales on tap were Skinners Heligan Honey, Penryn Cornish Sunset (excellent!) and Doom Bar, but these change regularly. Worth exploring the local mine working nearby on the coast. Well worth a detour to visit. Booked for Sunday lunch, 3 of us. Lovely welcome, very smiley staff, drinks ordered at bar then shown to our table! Good selection of Cornish ales/cider... The Press Gang cider, being great! VERY generous sized portions! Roast beef with traditional Yorkshire pudding etc... Delicious! Starter of tempura veggies... Again great portions! Would love to sample one of their "special nights" such as Pie/curry nights as imagine it would be well worth it! Being only a few minutes from the South West Coastal path at the crown mines, Botallack, it's very handy for walkers... And WELL worth the diversion!!! Will be back and would heartily recommend it!! 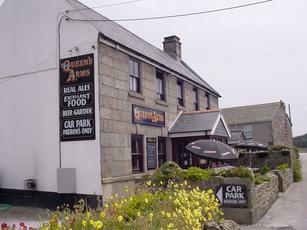 Visited this pub after doing the Coastal path walk from Cape Cornwall car park. A fantastic walk, which is well worth doing. Very happy and surprised to find Addlestones cider here. Also had a still cider which was nice ... can't recall the name now. Seemed a nice enough pub and I would happily drink here again if I found myself in Botallack.